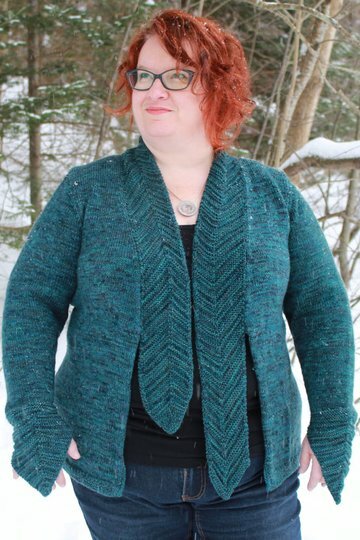 Chaos in the Machine is a simple open cardigan with dramatic details. 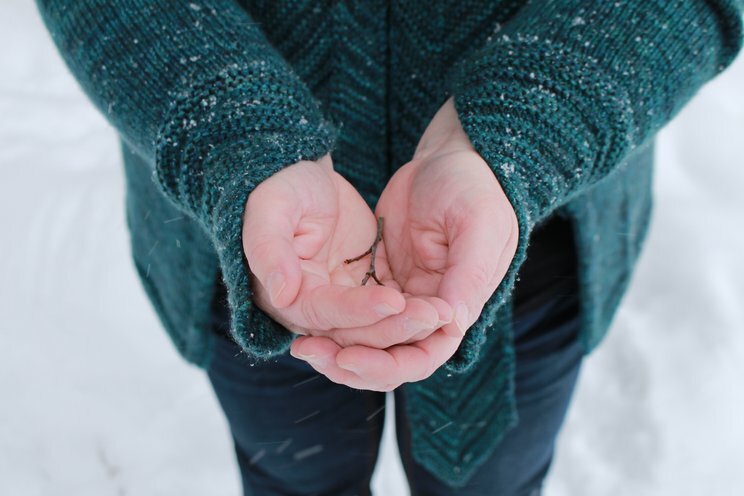 Mitered sleeves keep your hands warm, without getting in the way. The coordinating collar is knit separately and sewn on, so you can position it asymmetrically as shown, or even and balanced. 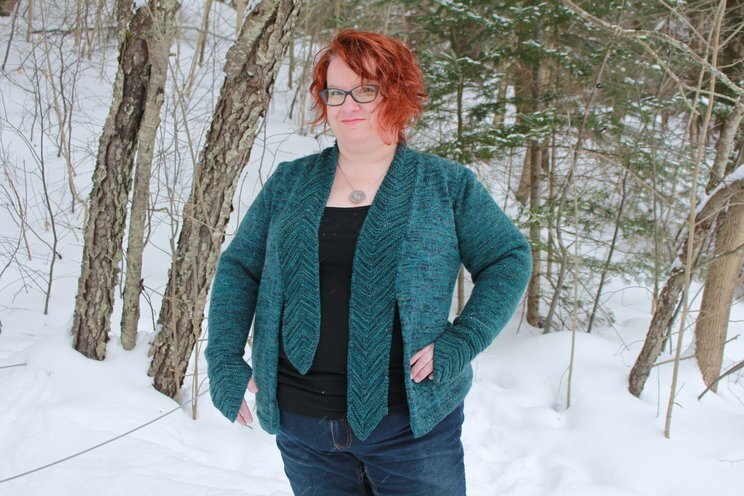 The sample was knit with 2 strands of a merino, cashmere and silk blend in slightly different colourways, held together to create a warm and cozy fabric. CustomFit allows you to choose your own sleeve and sweater lengths to match your preference. 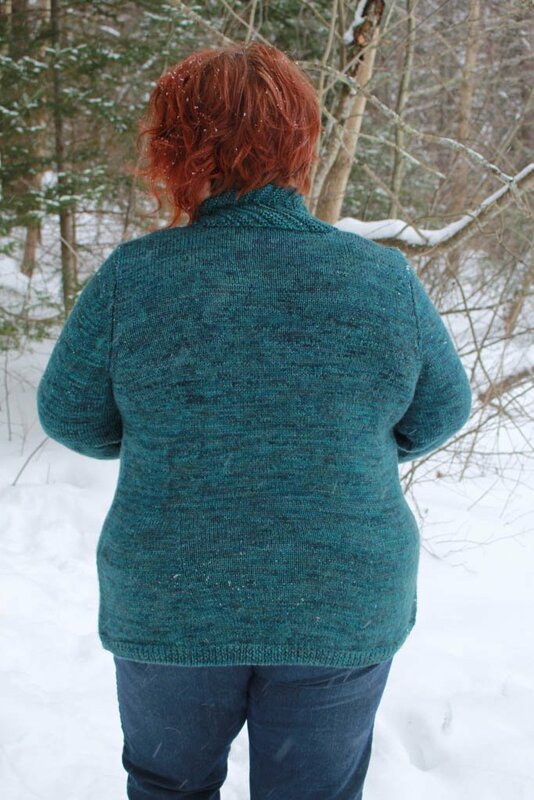 By design, Chaos in the Machine uses your "long" sweater length and a 3/4 sleeve length. One note on sleeve length: The sleeve length you choose will become the shortest part of the cuff; the mitred cuff instructions are then added to your chosen sleeve length. For typical gauges, the longest part of the cuff will extend 4-5'' (10 - 12.5 cm) below this point. 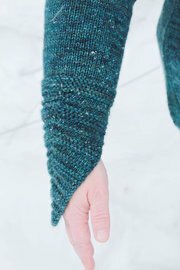 Choose your sleeve length accordingly - 3/4 sleeves will give you cuffs that reach (or partially cover) the back of your hand; elbow sleeves will result in a cuff that reaches the mid-forearm. Chaos in the Machine has an hourglass silhouette (with waist and bust shaping), but the waist shaping is located on the back only for a clean-fronted look. 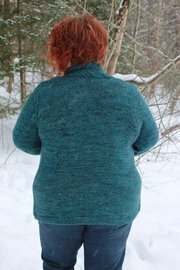 Kim's sample is knit in Indigodragonfly Chameleon Sock. Two strands in slightly different colourways were held together to create a warm and cozy fabric. If you're using Chameleon Sock held double and would like a similar look to the sample, Kim liked this combination knit up at 5.5 stitches to the inch.